Made by Boeing Aircraft of Canada Limited in Vancouver, Canada, 1944. By 1951 the final ocean to be traversed for air travel was the South Pacific between Australia and South America. In this aircraft, famous Australian pilot P.G. Taylor pioneered an air route by island hopping across the Pacific from Sydney to Valparaiso. 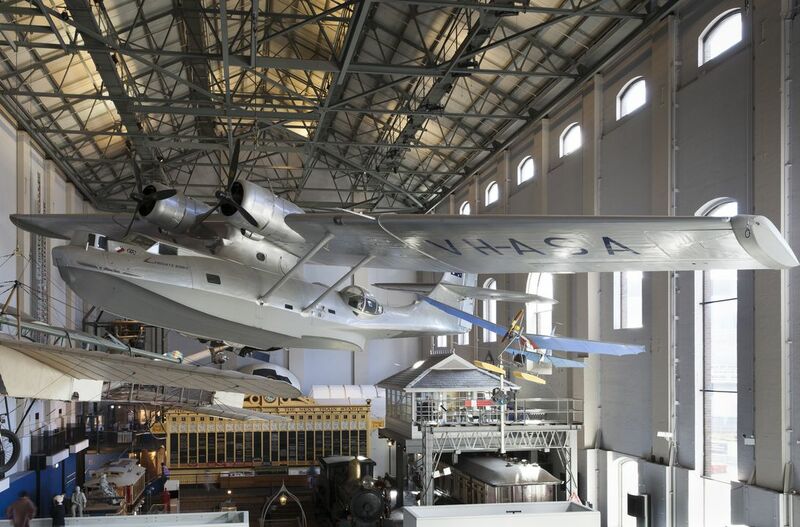 The Catalina flying boat, with its ability to land and take off in calm water, and its great endurance over long distances, was the ideal aircraft to accomplish the final aviation link around the world. The Catalina is a twin-engined high-winged monoplane flying boat with retractable wing tip floats. It features an almost cantilevered wing mounted above a shallow but broad hull on a central pylon housing the flight engineer. The wing has a rectangular centre section and tapered outer panels, all of stressed-skin all-metal construction, though the ailerons and trailing edges are fabric-skinned. A unique feature is the wing-tip floats, which are mounted on pivoted frames that can be retracted electrically so that in flight the floats form the wingtips. The hull is also all-metal, with a broad semicircular upper surface. The bow has a mooring compartment and transparent sighting window, with a roller blind giving seawater protection. A turret all-round window is fitted in the upper bow. The two pilots sit side-by-side in a wide cockpit with large windows all round. Left and right gunner stations have blister windows on the waist of the hull behind the wing. The tail is of a tall design, with the horizontal tail mounted well up the single fin. The power plant comprises a pair of two-row Pratt & Whitney Twin Wasp engines neatly cowled on the centre section with cooling gills. The engines drive Hamilton variable-pitch propellers. The interior of the aircraft, including cockpit instruments, is incomplete, having been stripped from the aircraft years before it was given to the Museum. Remaining items were removed and stored to allow for restoration and exhibition. Maker: Boeing Aircraft of Canada Limited, Vancouver, Canada, under licence from Consolidated Aircraft (later Convair) of San Diego, California, USA. National flags of Chile and Australia on either side of the bow. Registration letters 'VH-ASA' on either side of the vertical stabiliser below the horizontal stabiliser. National flag of Australia on either side of the vertical stabiliser above horizontal stabiliser. Registration letters 'VH-ASA' on starboard and port outer wing panels. Dzus fastener alignment marks. In 1932 the US Navy announced a design competition for a new long-range patrol flying boat. It was to have a range of 3,000 miles, cruise speed of 100 miles per hour and gross weight of 25,000 pounds. At that time the principal aircraft in this category was the Consolidated P2Y Ranger, a twin engined sesquiplane patrol flying boat designed by Consolidated's chief engineer, Isaac Macklin (Mac) Laddon. To meet the US Navy's demand, Laddon produced a new design and developed what was to become the Consolidated Model 28, later known as the Catalina. The prototype was the XP3Y-1, which first flew on 21 March 1935 at Norfolk, Virginia, Naval Air Station, with company test pilot William B Wheatley. The rival Douglas XP3D-1 was also a good aircraft, but the Consolidated boat won the Naval contract because it was a cheaper buy at $US90,000 as against the $110,000 price tag for the Douglas. An order for 60 of the new Consolidated flying boats, to be designated PBY-1, was placed with Consolidated Aircraft on 29 June 1935 by the US Navy while another 50, designated PBY-2, were ordered two months before the first aircraft was delivered. These massive orders saw Consolidated move, in mid-August 1935, 3220 km from Buffalo, New York State, to San Diego, in southern California, where the weather was better. The cold northern winters had caused ice to form in the waterways, making flying boat operation dangerous until the spring thaw. The change of designation from P to PB for the production run indicated that the aircraft was to be a patrol bomber rather than just a patrol aircraft. The PBY-1s went into service with the US Navy in late 1936 and the first PBY-2 was delivered to the Navy in May 1937. Production turned successively to the PBY-3, PBY-4, PBY5, Nomad, -5A and -6A amphibians differing mainly in having more powerful variants of the Twin Wasp engines and the use of upgraded equipment. The Nomad was produced with a modified hull and tall tail, the latter also being incorporated into the PBY-6A. Internationally the Catalina was recognised as an excellent patrol aircraft and in 1937 the Soviet Union negotiated a contract for licence production and engineering support. Thus PBYs, designated GST, were built under licence at Taganrog on the Sea of Azov, before the area was overrun by the German army in 1941. In 1939 a PBY-4 was bought by the British Air Ministry and tested at Felixstowe, East Suffolk. It proved so outstanding that it was adopted as a standard boat for coastal command and an order for 200 was placed on 20 December 1939. The name Catalina was coined by the British in 1940 and is derived from the name of an island off the coast of California (Santa Catalina), north of the Consolidated factory at San Diego. No flying boat, in fact no large US Navy aircraft, had ever been ordered in such quantities. Such was the demand for the Catalinas that, when the Royal Canadian Air Force sought to replace its aging Supermarine Stranraer flying boats in 1939 with PBYs it was unable to do so because all production was allocated to the Royal Air Force and the US Navy. This caused British officials to help arrange for licence production of Catalinas by Canadian Vickers at Cartierville (Montreal) and Boeing of Canada at Vancouver. The San Diego plant also more than doubled in size and was joined by an even larger plant a mile down the road. In September 1940 the Boeing Canada Company in Vancouver, British Columbia, received a contract for 55 PBY-5A amphibians which were to be assembled from parts supplied by Consolidated. The first Boeing-produced PBY, known in Canada as Cansos, named after the Strait of Canso which lies between Cape Breton Island and Nova Scotia, was completed on 27 July 1942. Ultimately Boeing Canada produced 362 Cansos in two types, the PB2B-1 and the tall-tailed PB2B-2. More Catalinas were built than any other flying boat in history. Total production of all versions of the Consolidated Model 28 totalled 3,272. Of these, 1,854 were flying boats and 1,418 were amphibians. Some 731 were built in Canada by the two Canadian plants. This type of aircraft transformed the ocean patrolling capability of the US Navy in both flying boat and amphibian types, with good load-carrying capability and an amazing range and endurance. Consequently, it became one of the most durable and effective aircraft of the Second World War. Catalinas were used by virtually all the Allied services, including the RAF and RAAF. Although it was one of the slowest combat aircraft of World War II, it outsold all the newer, faster and better-equipped replacements of other manufacturers. The Museum's Catalina is a type PB2B-2, built under licence in 1944 for Consolidated Aircraft in Vancouver, Canada, by the Boeing Aircraft Co. Sixty seven PB2B-2s were made by Boeing between September 1944 and March 1945, with forty seven going to the RAAF and the rest used by the US Navy and the RAF. In the RAF it was known as the Catalina Mark VI. Its most significant feature is the tall tail and larger rudder introduced on the PBN Nomad. Otherwise it is basically of PBY-5 specification, but it incorporated all the late production equipment. It was originally fitted with a twin-gun bow gun turret manufactured by the Ryan Aeronautical Co. of Lindbergh Field. The offensive armament was removed prior to handover to P.G. Taylor. The "Eyeball" was removed and a plate fitted at Rathmines while the "head up" was removed at Quintero Naval Base, Chile due to damage sustained at Easter Island. The aircraft was originally finished in dark sea grey upper surfaces over white but this was replaced with the silver and grey of an aircraft used by the RAAF for Air -Sea rescue service after it arrived in Australia in September 1945. The PB2B-2 Catalina was fitted with two Pratt and Whitney R1830-92 Twin Wasp engines of 1,200 hp each. The first Catalina to arrive in Australia was in 1938 when "Guba", a privately-owned Model 28-2 was leased by the Commonwealth Government. It was commanded by Captain P G Taylor on a survey flight across the Indian Ocean to Mombasa, Kenya for an Empire Route. This was thought necessary if Japan increased its aggression in Asia and the air route to England was cut at Singapore. In 1940 the PBY-5 version of the Catalina was ordered for the RAAF. They were ferried across the Pacific by a combination of Qantas and RAAF crews, and the first aircraft was accepted on 5 February 1941, piloted by Captain Lester J. Brain, with Capt. Taylor as navigator. This was only the third aircraft ever to fly the direct route across the Pacific. The last Catalina, A24-386, arrived on 3 September 1945. In all, 168 Catalinas were operated by the RAAF under the following serial Nos. A 24-1/114, A24-200/206, A24-300/309, and A24-350/386. These aircraft included two PBY-4s taken over from the US Navy, Mks I, II and IIA (PBY-5 flying boats), MK III(PBY-5A amphibians) and Mk IV and MkVI (Boeing built PB2B-1,-2). With their long range and endurance, the Catalinas established an impressive war record and operated with Nos 11, 20, 42, 43 Squadrons, Nos 6 and 8 Com. Units, and Nos 111, 112, 113 ASR Flights. Catalinas also served a civil role in Australia during the war. A small fleet was operated by Qantas Empire Airways for two years between July 1943 and June 1945. During that period Catalinas undertook 271 ocean crossings between Ceylon and Perth, 3,513 miles (5,653 km) in radio silence, non stop and airborne for up to 31 hours. This incident-free operation was the world's longest non-stop airline sector. Post-war a number of Catalinas were used in commercial operations, notably by Qantas, Barrier Reef Airlines and TAA's Sunbird Service. The Museum's Catalina PB2B-2 was built under licence for Consolidated Aircraft by the Boeing Aircraft Company in Vancouver, Canada, in 1944. Following its test flights, the aircraft was flown to San Pedro, California. It was then handed over to the RAAF San Pedro Ferry Detachment, given the RAAF Serial No. A24-385, and flown across the Pacific by an RAAF crew, arriving in Australia on 3 September 1945. It was the second last RAAF Catalina to be received, only weeks after the surrender of Japan on 15 August 1945. Many Catalinas at this time were used in the South West Pacific area to bring home to Australia the ex Prisoners of War well enough to fly. Following this they flew back Australian soldiers from Borneo, New Guinea and the other islands due to be discharged from war service. On the outward flight from Australia the Catalinas carried clothing, footwear, medical supplies, fresh fruit and vegetables, and meat. These flights continued up to March 1946. Unfortunately, exact details of the duties of the Museum's Catalina at this time are not known as neither the pilot nor aircraft logbooks have survived. However it is known to have been allocated to 43 squadron for 4 months before being returned to storage in February 1946. It was then allocated to 112 air-sea rescue flight as a standby for aircraft No. A24-109 but because of an unserviceable air screw, No. A24-300 was issued instead. Following repairs it was issued to Rathmines RAAF flying boat base on Lake Macquarie, NSW, but was damaged in a hailstorm and after repair was allotted to the New Guinea administration for air-sea rescue. In August 1946 its 360-hour check was undertaken at Rathmines, after which it was allotted to 111 air-sea rescue flight. However, following disbandment of this unit in January 1947, it was again issued to Port Moresby. More repairs were undertaken after a beaching accident which damaged the hull and port float when the beaching gear collapsed. After this it was issued to 11 squadron in September 1949, its last duty with the RAAF. In 1950 Captain Patrick Gordon "Bill" Taylor was given permission by the Australian Government to carry out a survey flight to establish an air route between Australia and South America. The Government allowed Captain Taylor to select an aircraft to achieve this flight and the best available was A24-385, which was officially handed over to him on 22 August 1950. Despite its good condition, it was given a thorough overhaul by the RAAF, repainted, named "Frigate Bird II" by Taylor and given the Civil Registration VH-ASA. It was originally allocated the civil registration VH-AGB but Taylor requested the more appropriate VH-ASA (indicating Australia South America), which he was granted. On 13 March 1951 Taylor set off from the flying boat base at Rose Bay in Sydney with the smallest workable crew: Captain George Henry "Harry" Purvis (first officer), Eugene Dennis "Blue" L'Huillier (engineer), Angus Allison (radio officer and bowman) and "Sydney Morning Herald" journalist, Jack Percival (executive officer and official correspondent). They made a shakedown flight to Grafton, NSW, landing on the Clarence River, and next morning headed east for South America. Stops were made at: Noumea, New Caledonia; RNZAF Station Luthala Bay, Suva, Fiji; Stapuala Bay, Samoa; Aitutaki; Cook Islands; Papeete Harbour, Tahiti; and Mangareva, French Oceania; and Easter Island. The necessity to refuel at Easter Island, where there was no sheltered area of water for take-off, was a serious hazard for a grossly overloaded aircraft. There the crew suffered through a storm, a freak swell broke all three anchor ropes, and Taylor was washed overboard. Finally take-off was executed with the assistance of the JATO rockets (jet-assisted take-off) that had been fitted to the hull by the RAAF at Rathmines. On 26 March 1951, Taylor, escorted by a Chilean Air Force Catalina, reached the capital of Chile, Valparaiso. There he landed near the Quintero Air Force station and was warmly welcomed by the President of Chile after covering 8,500 miles (13,679 km). On 3 April Taylor left Quintero for the eventful return flight, which saw the starboard rockets fail to fire when taking off in another storm from Easter Island and the plane nearly smashed to pieces on the cliffs at Ovahe Cove. They arrived back at Rose Bay on 21 April to a large reception. The aircraft was subsequently presented to Captain Taylor by the then Prime Minister, Sir Robert Menzies, in recognition of the first air-crossing of the South Pacific Ocean and in appreciation of the many surveys made by the famous aviator. It was not until 1970 that serious talks aimed at establishing a service between Australia and Chile commenced. Later Taylor returned to Australia and served as a tactical air flying instructor in the Australian Flying Corps until the end of the war in 1918. After this he undertook an aviation engineering course, taught himself navigation, and received the first navigator's licence issued by the Department of Civil Aviation. In 1930 when Kingsford Smith and Ulm founded Australian National Airways to fly between Sydney, Melbourne and Brisbane, Taylor joined as a pilot, but the company foundered and Kingsford Smith and Ulm enlisted Taylor for pioneering overseas flights. In 1933 Taylor navigated for Kingsford Smith when he flew the "Southern Cross" from Australia to New Zealand. The next year he flew with Kingsford Smith in the Lockheed Altair "Lady Southern Cross" on the first west-east crossing of the Pacific. In 1935 Taylor was flying mail to New Zealand with Kingsford Smith in the ageing "Southern Cross" when the starboard motor cut out and the port engine began to lose oil. The aircraft continued to lose altitude despite dumping the mail and freight. Taylor climbed out onto the struts of the aircraft six times and retrieved oil from the dead engine and transferred it to the labouring engine in a thermos. For his bravery Taylor was awarded the Empire Gallantry medal (later changed to the George Cross). In 1939 Taylor captain-navigated the Catalina flying boat "Guba", trail blazing the great commercial air routes across the Indian Ocean between Australia and Africa. During World War II he ferried American Liberator bombers across the Atlantic and Catalinas across the Pacific in 1941. In 1942 he flew Netherlands East Indies naval Catalinas with VIPs between Java and Hawaii and in 1944 was engaged by the RAF to survey a mid-Pacific route linking Mexico with New Zealand. For this flight he was provided with a Catalina IVB JX275 at Bermuda, and named it "Frigate Bird". By the end of the war there was only one ocean expanse still unconquered by air, the South Pacific between Australia and South America. In 1950 Captain Taylor was determined to establish an air link from Australia to Chile. With official support from the Commonwealth Government, he was provided with the Boeing-built PB2B-2 by the RAAF, A24-385, which he named "Frigate Bird II". The pioneering survey flight was successfully undertaken in 1951. After his return to Australia from Chile, at the age of 55, Captain Taylor, a widower, married a young schoolteacher and in 1954 was knighted. Taylor then considered using "Frigate Bird II" for his own commercial operations, but this was not financially possible and attempts at selling the aircraft were unsuccessful. In 1954 the flying boat was removed from the Civilian Register and made its last flight back to Rathmines for storage. There it suffered from the removal of numerous items for spare parts and by souvenir hunters either working or training at the base. When the base closed in 1956 Taylor had the aircraft dismantled and towed on a barge to the flying boat base at Rose Bay in Sydney. Sadly, by this time, "Frigate Bird II" was in poor condition. After initially being stored in the back of the Ansett hangar at Rose Bay it was later moved outside, where its aluminium hull suffered from exposure to the elements and vandalism. The aircraft's deterioration continued and Taylor was faced with the possibility of scuttling the aircraft at sea until, in 1961, his attention was drawn to the Museum by a friend and aerophilatelist, Mr Ernest Crome, and he consequently presented the Catalina as a gift. Taylor recorded his adventures in seven books, with the 1951 Sydney to South America flight described vividly in "Frigate Bird". He died suddenly in Honolulu at the age of 70 of a heart attack on 16 December 1966. Taylor had piloted 71 different types of aircraft. In the 1960s the Museum's display area was very small, so the Catalina went into storage. It was lent during the 1970s to the Camden Museum of Aviation, but after that Museum was forced to leave its site the Catalina was kept in storage until 1985. Structural and cosmetic restoration was then undertaken by Hawker Pacific Pty Ltd at Bankstown Airport, Sydney, to take the aircraft back to its 1951 appearance. At a special ceremony on 17 June 1987, attended by Sir Gordon Taylor's widow, Lady Joy Taylor, the Catalina was hoisted 10 m above the floor of the Boiler Hall of the Powerhouse Museum, back into its natural environment. A year later it formed the breathtaking centrepiece of the Transport Exhibition which opened to the public in 1988. This object is currently on display in Transport at the Powerhouse Museum.